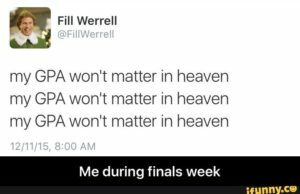 Ever read the meme that says “MY GPA WON’T MATTER IN HEAVEN?” Yes, we all get to that point during finals. With so many deadlines to meet, we become so stressed out by the overload that we seem to fall off the earth. Call me crazy, but during my study sessions I enjoy reading aloud and even making songs out of my lecture notes. 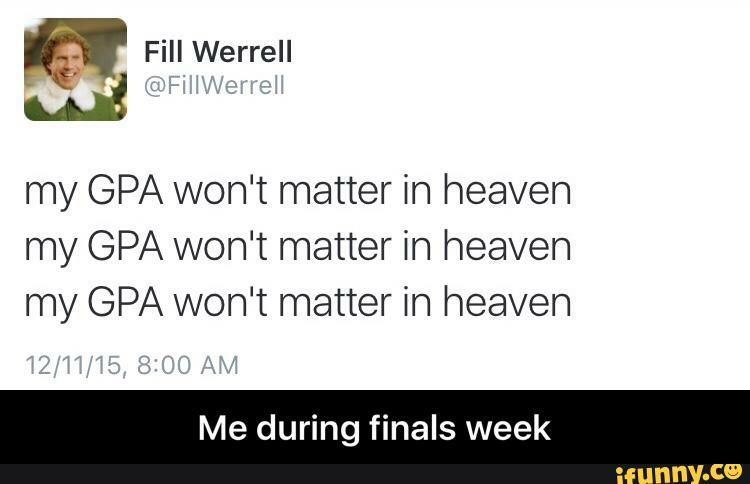 Don’t be the one that sits there and just studies; be the one that has the attitude of “I’m going to ace this final,” “I will keep an uplifting attitude”! Reading aloud helps you to focus on each word individually and it’ll make you pronounce each word effectively and please, please, treat yourself during study time. Instead of grabbing a snack from a box, make your own snack. Get creative. This will relax you a little bit and ease your stress level. We can become so sleepy and unenergized that we indulge in unhealthy eating to stimulate the struggle. Eat smart, become smart. Right? Most importantly, stay away from negative people. If they’re not helping you study or spreading positive energy, their stress will only add onto your stress! Just relax. The time will pass, and it will be summer or spring, and your worries will be out the window. Remember, this isn’t your first and last exam. You’ve got this. Good luck!